Hello again. The third and final part of my blog of our stay in the lovely Chew Valley and also the last blog of the summer. The time has simply flown by due in no small part to some stunning weather. And it looks like it’s going to continue too. Lovely. To be honest, there’s not an awful lot to tell you since the last blog – mainly because we haven’t done much except enjoy the sun. On Saturday however it was cloudy, so we fired up the old crate and headed out past the south of Bristol to the coast, first to Portishead. A pretty enough town with a high street and a shiny new marina development. Trivia time here: Remember the ITV series called Vice a few years back starring Ken Stott? Well, the theme tune was called ‘Sour Times’ by a band from the area called…..Portishead. Click here for a link to the song if you want a reminder. 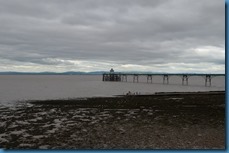 Next up, and just down the coast was Clevedon, a largely Victorian seaside town with a quaint little pier that’s been well restored – although you have to pay £1.80 for the privilege of walking on it. 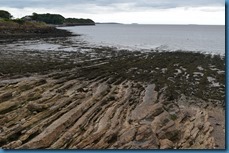 More recently Clevedon was the setting for the town of ‘Broadchurch’ in the popular ITV drama series of the same name. We stopped for lunch at one of the eateries on the front. 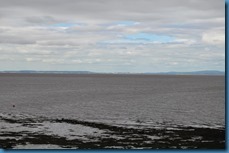 South Wales could be clearly seen across the Severn estuary. 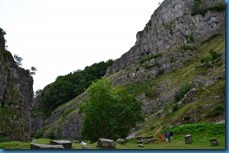 Final stop of the day – well almost – was Cheddar Gorge, although we didn’t really stop for long. The main car parks were all full and opportunities for pulling over for photos were limited. Further up the gorge there were more parking areas but stopping for more than a few seconds attracted the attention of a man in a hi viz west and a ticket machine. 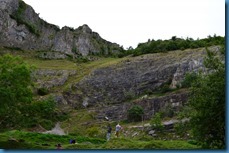 It’s a stunning place to spend a few hours but maybe not on a Saturday afternoon of a bank holiday in August. Tourists eh? 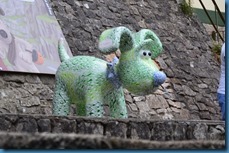 We did spot another gromit though! We paused for some liquid refreshments at a couple of establishments on the way back to the site. The awning came down on Monday evening and it folded away remarkably easily then we returned to the Ring O’ Bells in the evening for another meal. Both grog and grub were excellent again. Our final research expedition was on Tuesday night to the Bear & Swan in Chew Magna. Another pub featured on the site’s list and again it was excellent. Not the cheapest but worth every penny. So, Wednesday was upon us and time to leave and head home. Patsy was tractored to the entrance and re-united with Jessie. The chap from the site said he’d reading my blog and remarked that two of my comments were inaccurate. Visitors do not have to leave the site by 6pm as long as reception is informed and the £2.00 per person charge is only levied if visitors are not ‘booked in’ at reception. Clearly both myself AND Trev misread the leaflet but I am happy to set the record straight. Don’t forget the there is a comment box at the bottom of each blog online where anyone can comment about any of the drivel I come out with. Compliments are always welcome, but even complaints if I’ve got my facts wrong! Journey wise, the idea was that Trev would do the first leg as I was expecting a phone call from the solicitor to tell me contracts had been exchanged. We paused for coffee whilst I chased up both solicitor and agent and Trev ended up driving all the way, bless him. We had no trouble finding the site of course but unusually for a camp site there was security on the gate as well as the usual Wardens in reception. The site was full and we discovered that there was an evening meet at the nearby race track too. Anyway we got booked in and found our pitch and got set up. As we were having a look around the site, finally the phone call came that I had been waiting for. We had exchanged contracts on the flat at last and would take possession two days later. A further piece of the jigsaw fell in to place. Later that night we met up with friends from the midlands who were also staying on the site. We went to our local club and had a nice meal and catch up – all over a few beers of course. A guest ale was on so I could even claim to still be doing some research! So, that’s almost it, almost there. Just to bring you bang up to date, we were back at work for half a day today for a welcome back from the headmaster. We picked up a friend from hospital and got the keys to the flat. We’ve been around it with a tape measure and a note book and have a pile of brochures from a certain DIY chain to peruse. Patsy has got another couple of weeks work before she goes in to storage for a well earned rest. Until half term when we will be back at Crystal Palace for more ‘camping in the capital’. Keep an eye on the blog for some ‘in progress’ pictures of the flat in the meantime. I’m off to open the champagne now. Cheers!